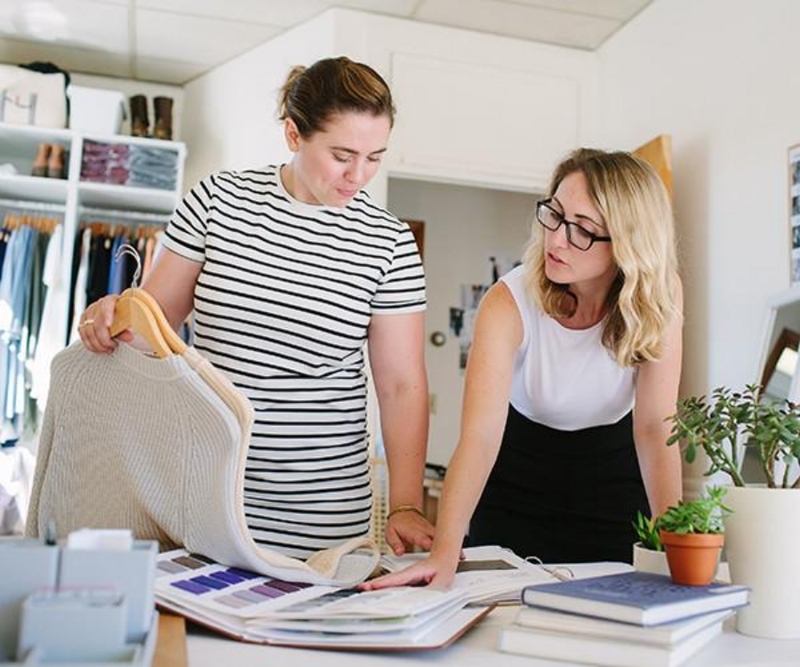 Brass Clothing, co-founded by Katie Demo and Jay Adams in Boston in 2014, is a fashion brand that offers high quality clothes at an accessible price point for the ambitious working woman. It aims to solve the problems women face in building their wardrobes. The designs are simple, versatile, and timeless. Always thinking about what their customers want and how to make their lives easier, Brass recently introduced The Closet Kit with three foundational pieces and The Clean Out Bag, a pre-paid bag that sends old clothes to a recycling facility. What is your background before co-founding Brass? I majored in marketing in college. I always wanted to do marketing, so I started doing PR and event marketing for a tech company in Cambridge, Massachusetts. It was a gaming company. It was actually during the recession, so it was an interesting time for people getting out of college and looking for a job. The tech industry specifically in Cambridge was booming, so I was able to get a job there. The company was really small, so I got my hands on many projects. I was able to learn a lot and really grow within that company. I ended up staying there for six years. But there was always something nagging me when I was working there. I wasn’t passionate about the industry or the products that I worked on. I was not that much of a gamer, and I wasn’t that interested in it, so I always felt like there was a gap between me and the people who were super passionate about it. I couldn’t keep working there anymore because I just didn’t care as much as other people. I started really thinking deeply about what did interest me and what I got excited about. And I realized that I had always had a real interest in fashion, and more specifically fashion as a form of self-expression, meaning what you could do with your clothes and your appearance to communicate who you are and set the tone for people’s experience of you. I thought if I need to get into the fashion industry to learn more about that, so I left the gaming company and got a job at a shoes and accessories retailer. I worked at the shoe and accessories company for around two years before I decided that I was ready to try something new and take on more challenges. Jay Adams, my co-founder, brought up the idea of us starting a brand together. We had been talking about how quality clothing was too expensive and the idea of making a Theory that I could afford. I was so excited about the idea of providing entrepreneurial and ambitious women a gorgeous high quality wardrobe that allows them to reflect their appearance and style. It felt so right. It was exactly what I wanted to do. We launched Brass in September 2014 but started working on it around January. We were doing our planning and talking to factories. It wasn’t until September 2015 that I left my job, so it was over a year and half that I was working full time and working on Brass. Finally, Jay and I both agreed that we needed to jump in full time, and it really made a huge difference, and we ended up growing five times more that year. We were thinking about words that made us feel really bold because that’s who Jay and I are. There is also this play on brass and gold. If gold represents the really high quality designer pieces, brass is just as cool and high quality but not at that price tag. As I said, I have always been interested in appearance and self-expression. I was at a point that I really wanted to level up my career and took the next step, and I was on this mission to get rid of all the poor quality fast fashion clothes in my wardrobe. They never made me feel confident, so I had been trying to build this wardrobe of really high quality pieces at more affordable prices. There are a lot of women out there who want to have it all, and we want to try to make their lives a little easier by providing them the wardrobe that are just really functional but make them feel fabulous every single day. How did you define and understand your customers? We make sure to have conversations with them. The moment we started selling, we reached out to them through emails and social media. For example, they told us that it would make their lives easier to have neutral color palettes and be able to mix and match. They leave reviews on our websites, and we read all of them to figure out what they want. We also do regular customer surveys, including questions such as tell us about your wardrobe right now and your work. We learned that almost 80% of our customers believe that their appearances impact their success at work. That is tremendous. We had a customer who told us that she was more worried about what to wear to the presentation than the actual presentation. These conversations fueled our mission to listen to them and build our brand for them. How did you decide what products to make? We knew we would start with dresses because that was a complete outfit. Because we didn’t have any customers, we surveyed our friends and family, and friends of friends and asked them what dresses they would like to see. From their feedback, we knew we needed to have a shirt dress, a fit and flare, and a shift. We only had dresses in the first two seasons because we wanted to become more stable, but we had always know that there would be a huge opportunity for us to get into tops and bottoms. 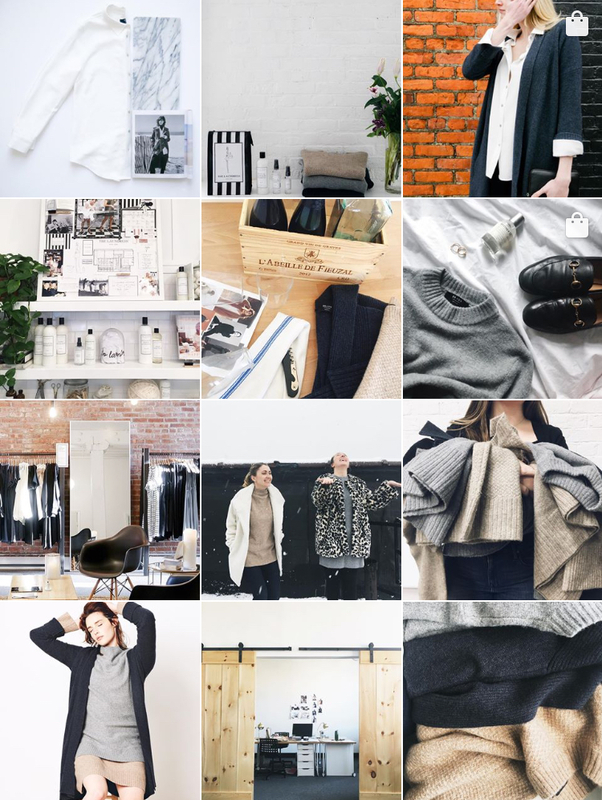 We design with the whole wardrobe in mind. We constantly think about what a woman needs in a business environment. We want her to have everything covered, from casual to dressy, from fitted to relaxed. How did you design them? Jay’s background is in apparel sourcing and manufacturing. She is in charge of our production. She works very closely with our manufactures in China to ensure we make the highest quality product for our customers. How did you source your manufacturers? Jay had a background in apparel sourcing and manufacturing. She was over in China doing a tour of factories when she came across with this amazing factory that works with DVF, Theory, and Vince, and she was really blown away by the quality that they were producing. She told me how excited she was to find this factory. They were making these gorgeous clothes and only cost $30. How did you decide the prices? Our prices are based on costs and margins that we want to achieve, but we also take into consideration of what we think is a reasonable price that conveys the value and high quality of the item. We want the price point to be accessible to young people. You set up a studio for private appointments and introduced The Closet Kit. How did you decide what additional services to offer? We set up our studio because we love meeting out customers, so we said to ourselves that we need to do something so that more people can come shop with us anytime. And people would actually email us asking if they could try on the products, so we want people to be able to access us five days a week, now six days a week. The Closet Kit evolved from conversations with our customers in those intimate settings when they talk about their wardrobe. It includes one top, one dress, and one bottom, and we give them The Clean Out Bag, which is a recycling bag, to get rid of the unwanted clothes. We believe so deeply in cleaning up the poor quality clothes that we we pay for the bag and shipping it to a textile recycler, so it doesn’t end up in the trash. Our first hire was the operation manager. She is in charge of customer service and logistics. We found her through a referral. Right now we are a team of five. How did you convince them to join Brass? I think to key is that you have to understand your own values, what’s important to you, and what your purpose is in the business. When that’s really clear to you and you can clearly communicate that, you are able to find people to get on board with you and get them really excited to do what you are doing. For us, they need to be interested in learning about our company and want to support the brand and the mission, even if they don’t have certain skills. They get to work directly with me and Jay and understand and be a part of the deep fibers of the business. How did you market Brass? Especially getting it heard by people outside of your friends and family circles. When we first started we did a lot of content marketing. We wrote a post called “The Myth of the ‘Maxxinista’” in 2014. It has over a million views on Medium. From there people were signing up for our email list, so we had a group of women who were interested just from that article. What social media strategies do you use? We asked women we really respected and who could really represent our brands to be our Instagram influencers, and we work with them and get people to tag us. We also advertise on Facebook and Instagram to target online audience by using key words. What kind of events did you do? We did a few pop-ups in New England and drove around with our entire collection in the car, and at those pop-ups, we did photo shoots with our customers. It was really just a special day for them to feel beautiful. Our customers came and signed up to get their photos taken in our clothes by a professional photographer. We would then use these photos on our social media. We call them our real models. We also did drinks and focus groups later. How did you grow your sales? When we first launched, we relied on social media and email marketing to grow the business. We did a Kickstarter campaign to launch our second collection. That really helped people to get to know us. How do you manage the competition with other similar brands? It is important for us to know that women would always have different brands in their closets, so we could look at other brands as competitors, but we could also look at them as peers. That’s the approach we take. There are definitely a lot of brands that sell business casuals and professional clothing, but what how we are different is that we are not just selling products, but we are really trying to help them. We have a lot of mentors. Old bosses at old jobs have been very helpful. We took on an executive leadership coach recently and that was great. Google, webinars, blog posts, we read all of them. I listen to a lot of podcasts as well. Making the decision to go full time. It was a risk. I was leaving a very secure job. There was some fear. It’s really important to lay a strong foundation of your business. Make sure to know your goals and have a vision of what you want your business to be. Align yourself with people in other business, especially people who also believe in your goals and values.